Since its inception in 1965, the Los Angeles County Museum of Art has been devoted to collecting works of art that span both history and geography. In October 2010, the museum will present a large selection of European men’s, women’s, and children’s garments and accessories. Fashioning Fashion: European Dress in Detail, 1700-1915 will examine the sweeping changes that occurred in fashionable dress spanning a period of over 200 years, with a fascinating look at the details of luxurious textiles, exacting tailoring techniques, and lush trimmings. The exhibition will tell the story of fashion’s aesthetic and technical development from the Age of Enlightenment to World War I. 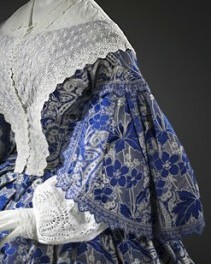 Read full story of Fashioning Fashion: European Dress in Detail, 1700-1915.